This is the challenge for this month. I haven't used this layout before. I had fun making my card though, and it seemed like it took forever to figure out which direction the card should go, and how I was going to coordinate all the components I wanted to use. 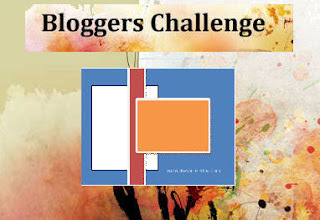 Here is the link back to Lisa's blog page where the challenge is posted. And here is what I came up with, using upcoming Easter as my subject. I used a medallion stamp of an Easter egg as the main image. The white background was dry embossed with a Sizzix folder bird on a branch. I used green glitter glue on the green, and pink glitter around the egg. The little eggs on wire came from Joann's, and the sentiment is from Stampin' Up. The white punched strip is just a scrap I found laying around from one of my border punches. The "scraps" from border punches really come in handy sometimes, and some are just as pretty as the border itself. I wish everyone a very Happy Easter! Hugs! Hello, Friends! I have five friends who have/had breast cancer, three of which are cancer-free at this moment, one who has had a partial mastectomy, and one who has just had a complete mastectomy and hysterectomy at the same time. After Christmas, I was perusing through the Christmas clearance aisles at Wally-World and found some beautiful Cancer Awareness wrapping paper for about 35 cents. Couldn't pass it up! I got an idea while looking around, that I've never seen thank-you cards or any cards that are cancer-specific. But I've never really looked for any either. I hope my friend likes these. I know she's been blessed by many people helping her through this tough time, and maybe these can be a little blessing in return. I hope you enjoyed your visit, and I'd appreciate you leaving a comment at the bottom of this blog to let me know what you think. Happy Spring! Hello! I hope everyone is doing well! I am recovering from my third rotator cuff surgery, and I think this one is right up there with the first one as far as post-op pain. The cuff and bicep were both sheared off of the head of my humerus, and this tear was much bigger than the previous one. Physical therapy is twice a week, and I haven't lost a whole lot of range of motion. The only things Doc Price and I can come up with as the cause for the tear is that I was in a wheelchair for 2 1/2 months after foot surgery, and pushing myself around with that repeated motion did it, along with picking up a 40 lb. bag of dog food. I guess my weight lifting days are over. hehehe It is very frustrating relying on others to do much of what one needs done, and can be embarrassing at times. I'm just glad they're here to help since hubby is outta town again! My term as a design team member with priscillastyles and Heartfelt Creations have come to an end at this time, and I am already missing doing my weekly projects, talking with the girls, and seeing what beautiful things they are creating! (sniff-sniff) I really enjoyed working on both teams, and everyone I was in contact with was wonderful!